Earn 4% cash back on gas and grocery store purchases. 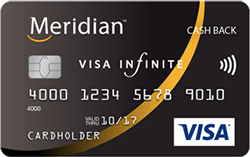 Membership with Meridian Credit Union is a regulatory requirement to hold a Meridian Visa Credit Card. You are not required to have other Meridian Credit Union products. For more information about Meridian visit www.meridiancu.ca/about. Please note that Ratehub.ca will be unable to confirm eligibility for any gift card promotions until membership with Meridian Credit Union is completed.